Today Madeleine and Leonore hosted a Prince and Princess Party for 12 children from Min Stora Dag. Madeleine has been Min Stora Dag's Patron for over 5 years and has long been doing engagements and attending events with them. She has even got her family involved with the charity- we have seen the King and Crown Princess both host audiences for children the charity helps with. If my American Readers are familiar with the Make a Wish Foundation, that is the American equivalent to Min Stora Dag. For the rest of my readers, Min Stora Dag grants "wishes" for seriously ill children around Sweden. At this Prince and Princess Party guests were told to dress in their royal attire and they were welcomed to the Royal Palace by Princess Madeleine. They dined on juice,cake, and cookies and were entertained by Tobbe Wizard, a popular children's entertainer in Sweden. The children were treated like royalty. I am not going to lie- this is probably my all-time favorite event the Swedish Royal Family has ever held (and that I am aware of- it that is a couple thousand I have read about). Madeleine didn't just put on a pretty day dress but she pulled out my *FAVORITE* gown and wore her best jewels. She gave the kids a real life Princess. And while she was wearing all of this- she got down on the floor to play with the kids. Let me repeat that- She was down ON the floor, playing with the kids, in her ONE-OF-A-KIND, who knows how expensive, beautiful gown. Madeleine wins an award. She just raised the level of expectations to a new level. I really hope this becomes an annual event because it was just so sweet. If I have not convinced you yet how precious this even was, watch this video from Min Stora Dag. Första unika filmen från sagokalaset på Stockholms Slott som Min Stora Dag arrangerade tillsammans med Prinsessan Madeleine. 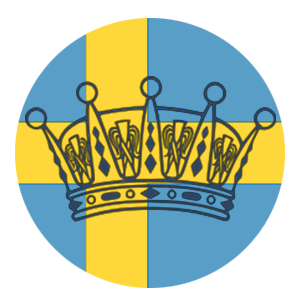 12 barn med svåra sjukdomar, från hela Sverige, lekte med Prinsessan, underhölls av Tobbe Trollkarl, åt tårta och fiskade fiskdamm. Var med och förverkliga fler önskedrömmar, swisha en gåva till 123 900 5133. Madeleine wore an almost identical copy of her Nobel Outfit this year- her Fadi el Khoury gown with her Aunt Margaretha's Aquamarine Tiara. She did wear a new pair of drop chandelier earrings. Madeleine looked amazing. Leonore came in a pink princess dress and fit right in with the rest of the guests. Feb 23 Happy Birthday Estelle!